Oops - we don't appear to have a video for the DR-C230. The imageFORMULA DR-C230’s robust construction and rugged document feeder were developed as a direct result of customer feedback. It represents a step forward in build quality in this scanner’s segment, effortlessly capturing up to 3,500 scans per day. Your productivity is maximised by the 60-sheet ADF that reliably feeds batches of mixed-sized document and media types: from passports and plastic cards to duplex A4, A3 (using folio) and long documents up to 3m in length. High-performance and flexible applications The imageFORMULA DR-C230’s premium build quality and productivity-focused features are a breakthrough in this value segment. Offering rapid scanning at up to 30ppm/60ipm, the imageFORMULA DR-C230 is the natural all-round choice for office departments and workgroups. Its quiet operation – and compact, attractive desktop design – make a great impression in front offices and customer service points, for example in banks, hotels, hospitals and government offices. 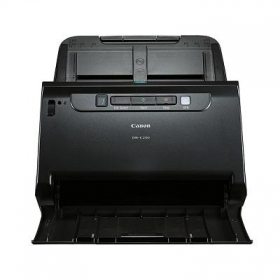 Precision paper handling To keep your workflows fluid, the imageFORMULA DR-C230 offers a powerful, high-quality feeding mechanism that ensures best in class reliability for scanning various documents, including ultra-thin papers from 27gsm. The ultrasonic Double Feed Detection and Double Feed Release (DFR) function allow scanning to restart quickly, keeping downtime to a minimum. Easy operation The imageFORMULA DR-C230 includes a wide range of high quality image processing capabilities. These include automatic page size and text direction detection, text enhancement, a deskew function and automatic colour detection. The user-friendly control panel lets operators scan with a press of a button – accelerating and simplifying scanning tasks. Compact and powerful The imageFORMULA DR-C230 is an ultra-compact and powerful desktop scanner featuring a robust design and reliable paper handling for capturing multiple document sizes and formats, including passports.